Today we're hearing from Jeffrey Augustine Songco, a Grand Rapids-based artist who won an Artist Seed Grant to bring "Society of 23's Locker Dressing Room" to ArtPrize Nine. Read on to learn more about this project, what inspires him, and more. I am creating a site-specific, multi-media installation titled "Society of 23's Locker Dressing Room" at the City Water Building by the Richard App Gallery. Using the existing architecture of a room within this vacant building, I am creating a mashup of a collegiate sports team’s locker room and a theater’s backstage dressing room. Visitors will see individual stations for each brother of the Society of 23, which includes a uniform/costume and various personal objects that describe and develop each brother’s character. The Locker Dressing Room will also include photos and videos of the brothers interacting with one another inside the room itself. "The Society of 23" is a mysterious brotherhood of twenty-three men. This brotherhood is a long-form, non-linear narrative I created in 2008 as an ongoing work of art. Rather than casting twenty-three different actors to play the roles of the brothers, I play each brother myself. 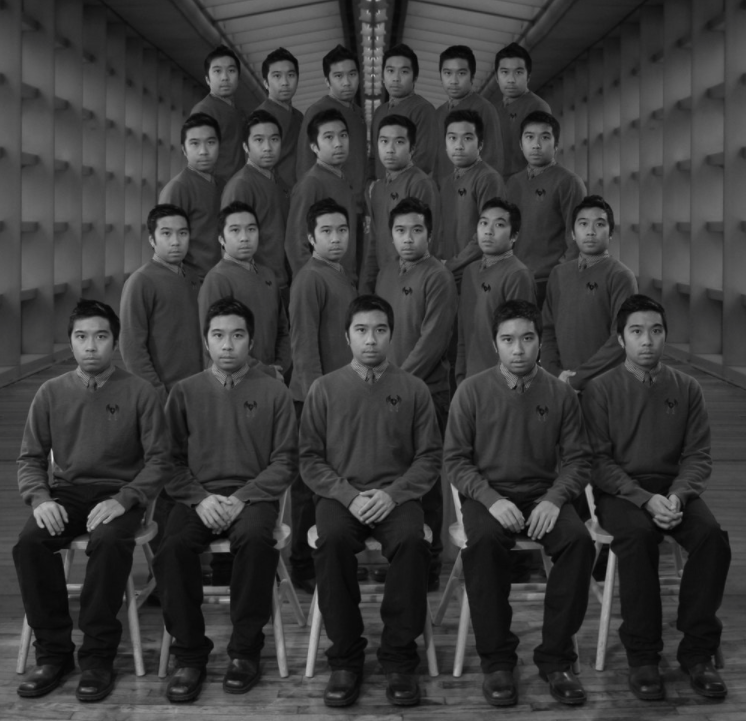 Early artwork about the Society of 23 was primarily created as photographs where I could use Photoshop to create layered scenes of my multiplied self. With each artwork came an introduction of a new medium and before I knew it, I had a complex world of material that went beyond a flat photograph of my face. The world of the Society of 23 became rich with sculpture, installation and live performances. In 2011, I entered ArtPrize for the first time with the sculpture “GayGayGay robe,” the ritual robe of the Society of 23. This year, I will explore the history and use of the robe. I have too many favorite artworks, but in relation to “Society of 23’s Locker Dressing Room,” I am really drawn to Matthew Barney’s "The Cremaster Cycle (1994-2002)," specifically The Order, a sequence from Cremaster 3 filmed in the Guggenheim Museum in New York City. I had the chance to study his work in school and then see his Guggenheim exhibition which included The Order. The immersive installation was really strange and beautiful, and I resonated with its themes, particularly the ideas of competition and masculinity. I’m a sucker for elements of performance, costuming and props, so it’s not a surprise that The Order is a big inspiration for "Society of 23’s Locker Dressing Room." A lot of my own personal anxieties inform my artistic practice. As a kid, I watched a lot of television. I learned about American culture from what I saw on TV. I’m still obsessed with television and media, and over the last decade I’ve intentionally followed national news stories that involve LGBT and minority narratives. I was also trained in ballet for a decade, performed in theater, and played the viola. I’ve always been interested in the production of performance, so not only do I love a script of a movie or musical or play, I love the costume design, set design, cinematography, musical score, etc. My artwork tends to be very theatrical because I love the production of storytelling, and a lot of the stories I make are about the anxieties that I experience in my life. I’d love to represent the USA at the Venice Biennale in 2023. The US pavilion is a spectacular space, and I’ve been fantasizing about appropriating it as the primary home of the Society of 23 for a long time. I’d love to use the history and architecture of the venue as interesting rules and elements of the brotherhood’s narrative. Imagine a giant dining room with a giant chandelier hanging above a giant circular dining table made for twenty-three men. Or a ballroom filled with people dancing at a gala scheduled to honor the brothers. American fraternities have such loaded narratives hidden behind these simple and classic facades, so I’d love to play with appropriation during this temporary event. I think the production behind the Venice Biennale is really interesting, too, so the entire process from concept to execution sounds like an incredible experience.